Looking for the perfect light summer meal with some substance to it? Here’s your dish! Ben said this one reminded him of the pasta bar from the Great Hall, one of the dining halls on Duke’s West Campus. Ordinarily I probably wouldn’t have taken that as the greatest compliment… but since we enjoyed so many dinner dates over humongous bowls of that pasta stir-fry when we were dating at Duke, I decided to take it as one. 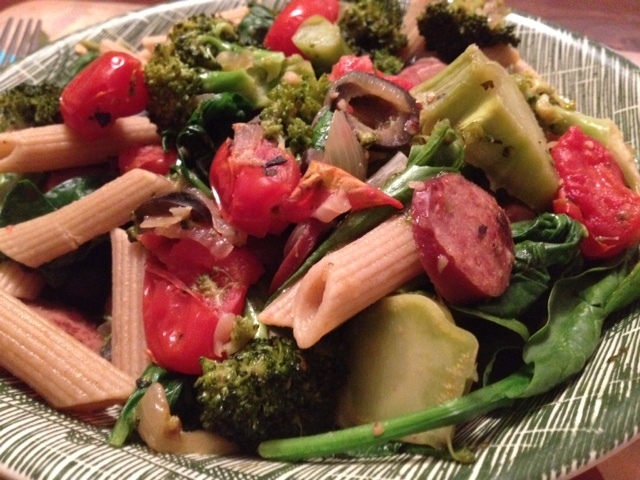 Besides, who can pass up a big bowl of pasta with a huge heap of fresh veggies, some smoky turkey sausage, and melted mozzarella cheese to top it all off!? I added some of my balsamic finishing syrup on top (since I put balsamic on just about everything) and a few more red pepper flakes. This dinner definitely did the trick! Meanwhile, heat olive oil on medium-high heat in a large skillet. Add onions, garlic, and turkey sausage, and cook, stirring, until browned- about 4-5 minutes. Add broccoli, tomatoes, broth, red pepper flakes, dried basil, and cook on medium-low heat until broccoli and tomatoes are tender and some of the liquid has evaporated. Slightly press down on tomatoes to release their juices and crush them. Add black olives and spinach. Cook, stirring, until spinach is wilted. 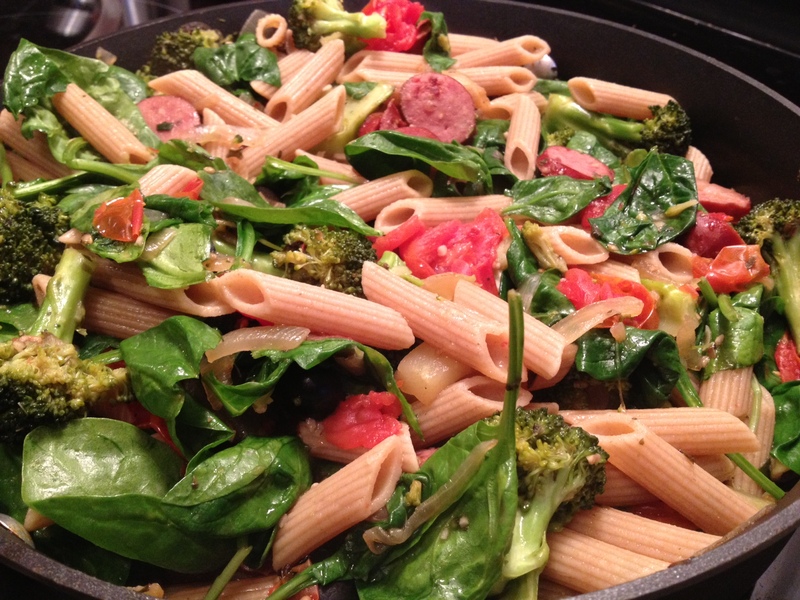 When pasta is done, drain and stir into the veggie and sausage skillet. Season with salt and pepper, and top with cheese and more red pepper flakes, as desired!